The Dhamma isn’t far away, it’s right with us. The Dhamma isn’t about the angels on high or anything like that. It’s simply about us, about what we are doing right now. Observe yourself. Sometimes there is happiness, sometimes suffering, sometimes comfort, sometimes pain, sometimes love, sometimes hate. 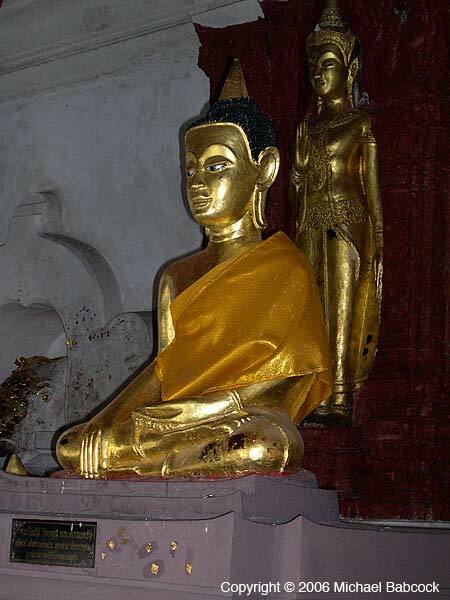 This is Dhamma, do you see? You have to read your experiences. – Ajahn Chah, in Food for the Heart, p. 368. From: Food for the Heart: The Collected Teachings of Ajahn Chah. Ajahn Chah. Wisdom Publications, Somerville, MA, 2002. 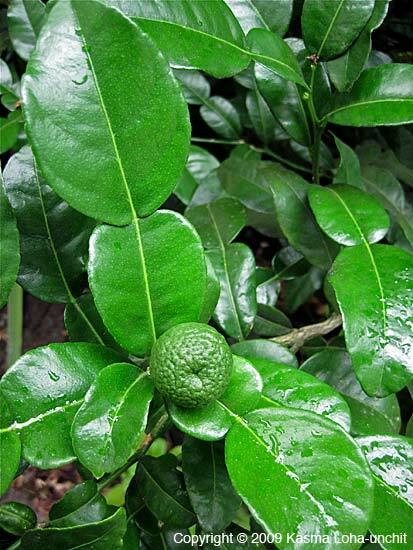 Ever thought about growing your own kaffir lime tree? Here are some good reasons why. Sunshine, warmth and the longer days of spring has brought my precious little kaffir* (see note at end of article) lime tree back to life. After shivering for several months in the cold and dark days of winter, this tropical gem has begun to sprout delicate bronzy leaves at the tips of its numerous branches while tiny purplish white flower buds form on other stems. To my relief, it has survived yet another winter. The double leaves and knobby fruits of the kaffir lime tree are very important flavorings in Southeast Asian cuisines. Their unsurpassed perfume has no equivalent, and therefore, they cannot be substituted with other citrus varieties. As for the fruit, the even more aromatic peel is minced and pounded with other herbs and spices to make curry pastes. 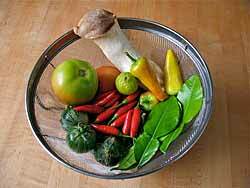 Together with lemon grass and galangal, it is one of the essential foundation flavors of many Thai and Cambodian curries. 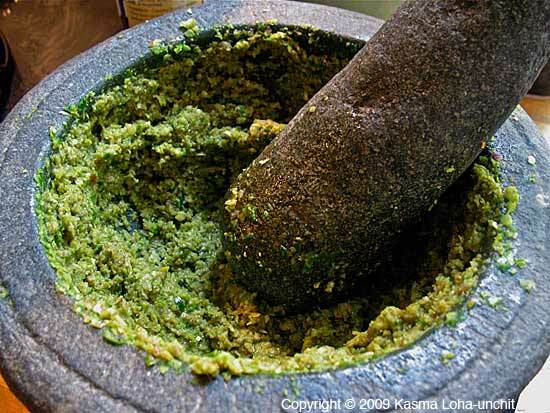 (See Making a Curry Paste from Scratch) The sour juice is aromatic, too, but is seldom used in cooking, as its strong perfume can be distracting in dishes that require a sharp limy sour flavor. It is instead used in cleansers, shampoos and medicinal preparations. But alas, this prized ingredient of Southeast Asian cuisines is not easy to find, especially if you are non-Asian. Only a handful of Bay Area stores carry them fresh or frozen, and although the dried leaves and peel are more readily available, they are often not clearly identified on the packaging. Asking for them by name may elicit from Asian shopkeepers the confusing response that kaffir lime products are illegal and that they do not carry them. Illegal? These shopkeepers are not pulling your leg but are protecting themselves. It is indeed illegal to import any kind of citrus into California without approval of state agricultural authorities. The California citrus crop is all too important a source of state revenues to risk the entry of any suspicious tropical bug which might wipe out the citrus groves. Those difficult days fortunately passed as immigrants began cultivating kaffir lime orchards in the central valley. 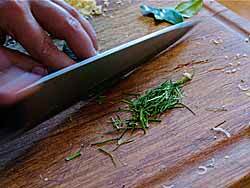 Now California-grown, kaffir lime seemed to have gained a legal immigrant status. The ensuing years found the lime more readily available from Southeast Asian markets mushrooming all over the state – until recently, when state agricultural authorities went on the rampage again. But aren’t these leaves now grown in California? Yes, but agricultural officials can’t tell whether the leaves in the unlabeled plastic pouches found in mom-and-pop Southeast Asian markets are actually California grown or smuggled in from abroad. If you have trouble finding kaffir lime leaves as many of my students do, my advice is to grow your own. Four Winds, a specialty citrus grower, in Fremont supplies Bay Area nurseries with kaffir lime trees. Ask any nursery near your home to order you one, preferably in a more established five-gallon size. Or if you prefer, you can order it yourself from Four Winds Growers in California. Plant in a warm sheltered location in your garden either in full sun or partial shade. If there is danger of frost in your area, plant in a large container that can be moved indoors on cold winter days. 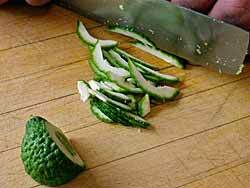 Once established, the plant will grow abundant leaves during the warm summer months and a handful of limes. Prune during the active growing season to encourage bushiness, using the prunings in your summer Thai cooking spree and freezing the extras for the winter months when your plant goes dormant. Both leaves and fruit freeze well for up to a year when wrapped well in a few layers of plastic. *A South African friend has informed me that the word “kaffir” is a very offensive word to non-whites on the continent from where she came. 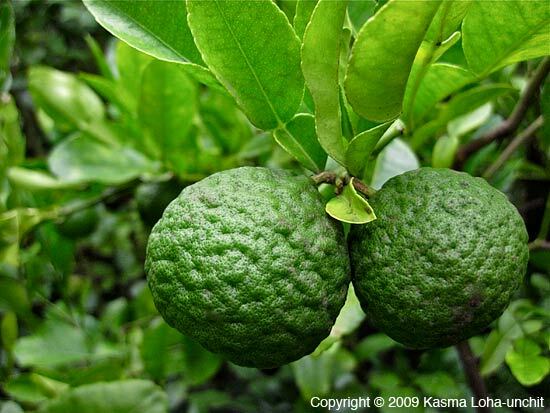 I have no idea how the word became the English name associated with this lime, but in Southeast Asia it is called something entirely different: makrut (Thailand), jeruk purut (Indonesia), daun limau purut (Malaysia and Singapore), krauch soeuch (Cambodia) and shauk-waing (Burma). I apologize for using the word “kaffir” to refer to the lime in this article; it is not my intention to offend anyone but to refer to it by the most common name by which you may be able to locate it in the Bay Area. Written by Kasma Loha-unchit, March 2010. If you look, you’ll find any number of interesting dragons in Thailand, mostly at the temples. 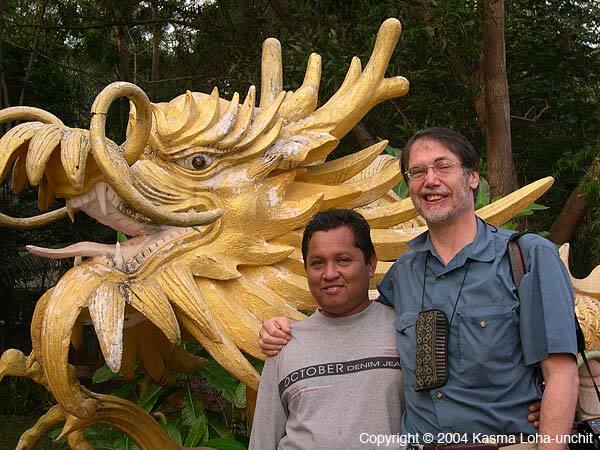 Kasma took this picture of myself and our Thai driver, Sun, on the coast of Chumphon back in 2004. Both Sun and I have a few more grey hairs since then! UPDATE: Alas, my favorite noodle shop is now closed (probably in 2013, actually). 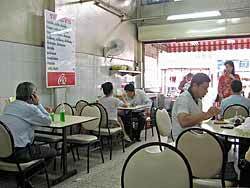 If you’re looking for another noodle shop in Thong Lo, try Lee’s Noodles. I’ll leave this blog posted for historical reasons. I have a particularly fond spot in my heart for duck noodles in Thailand; luckily they are available at in a little duck noodle shop at the Thong Lo neighborhood where I often stay. 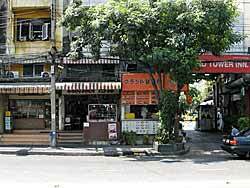 It is on Thong Lo (Sukhumvit Soi 55) on the Soi 55 side somewhat more than a block in; so quite close to the Thong Lo Skytrain stop. 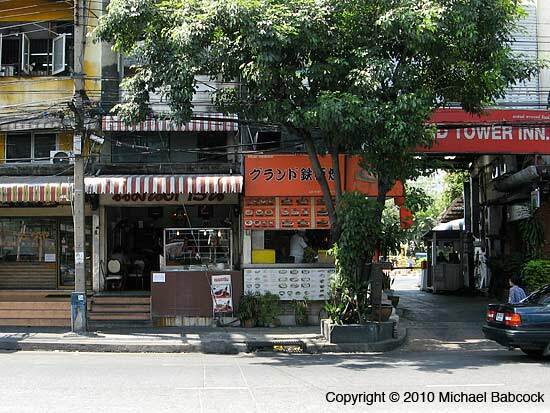 It’s next to a Japanese bakery and on the other side it’s two buildings before a driveway for the Grand Tower Inn. (The bakery address is 25/15.) You’ll see the plump ducks hanging in the glass display case in front. 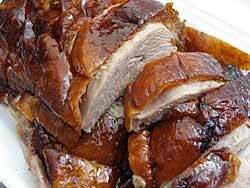 To my taste, the duck in Thailand tastes a whole lot better than what we get in the states. They seem plumper and tastier. There is somewhat less fat (it is a warm climate, presumably they don’t need it there) and the taste is just exquisite. 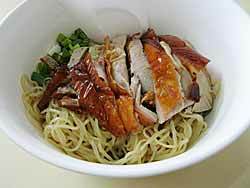 Like most noodle shops, this one specializes in one type of noodle, in this case, duck, roast duck (such as you find hanging in Chinatown stores here in the U.S.); there are other shops that serve, instead, stewed duck noodles. This shop also sell pork dishes, and though the crispy pork looks very appetizing, the only thing I’ve ever ordered there is duck. On occasion with Kasma we’ll order a plate of the duck and some chinese kroccoli cooked with oyster sauce. The other 90% of the time, I’ll get “Dry Duck Noodles” – Ba Mee Bped Haeng. 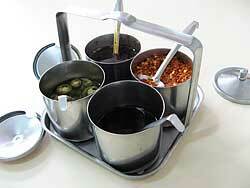 The cost is 55 baht. This might be considered somewhat pricey compared to street stalls but there is a substantial amount of duck and I think it’s well worth it. 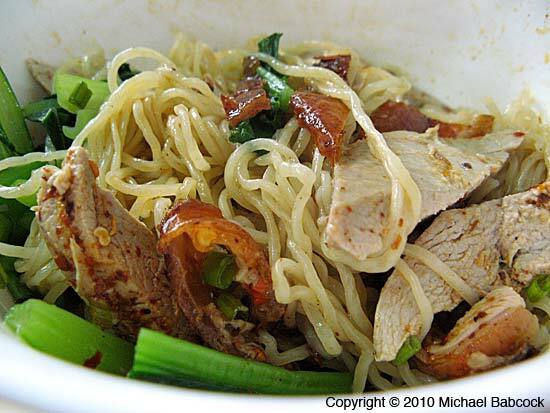 When you order noodles in Thailand you first specify the type of noodle; in this case it is ba mee, a thin wheat noodle. 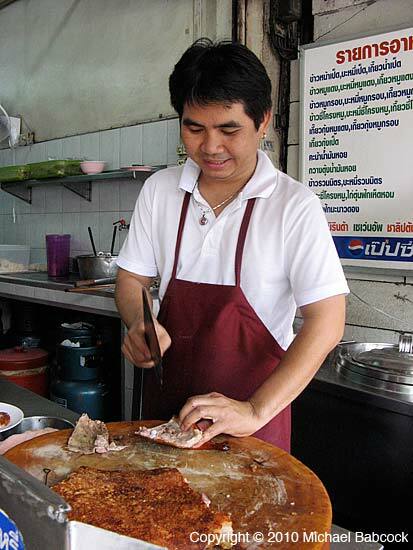 Next you specify the meat – bped, meaning duck. 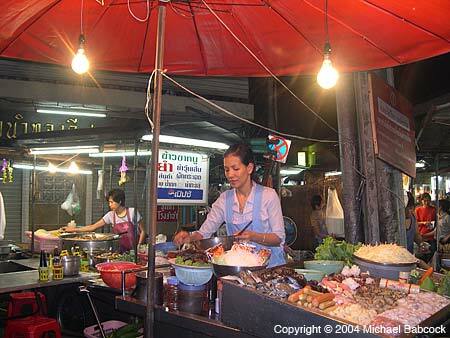 Then you specify whether you want soup noodles by saying nahm (water, meaning soup) or haeng, meaning dry. Each bowl is made to order and will include some greens along with the noodles and duck. 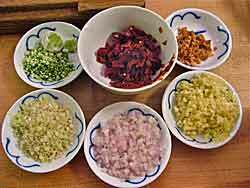 The noodles come largely without flavoring – you are expected to spice them up according to your taste preference. 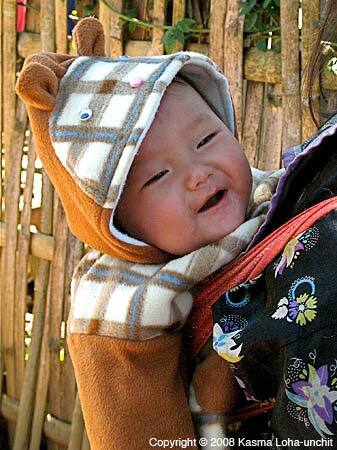 I have a theory that this learning to balance and harmonize flavors from an early age (whenever they eat noodles) helps Thais to be such excellent cooks. I like to add a fair amount of the chillies in oil (I take it to the edge of my heat tolerance) along with some sour, salty and a bit of sugar to balance. After the initial additions, I’ll take a taste and then adjust as needed until it’s just right. They offer various soft drinks but I usually just get the tea in a glass; it’s free, but the ice is 3 baht. 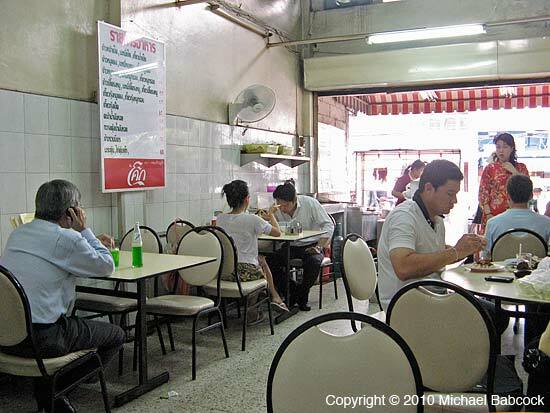 Some noodle shops have a plastic container of weak tea (or water) on the table. We often get a half a duck to go when we leave. They package it up in a styrofoam container and give you a package of gravy, package of soy sauce based dipping sauce, and a package of pickles. We’ll eat it later, sharing with Kasma’s sister and mom. Written by Michael Babcock, March 2010. Updated December 2014. This is vendor at the Sukhumvit Soi 38 night market is cooking dishes to order. 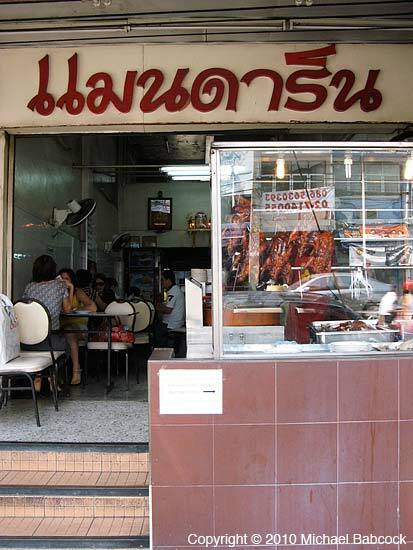 My first meal in Thailand was a dish of duck noodles from this market at around 3:00 a.m. in November, 1992. There were about 20+ stalls set up and the whole area was lit up as bright as day. And I was not the only one eating – they were doing a brisk business! 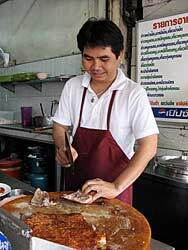 You are currently browsing the Thai Food and Travel Blog blog archives for March, 2010.